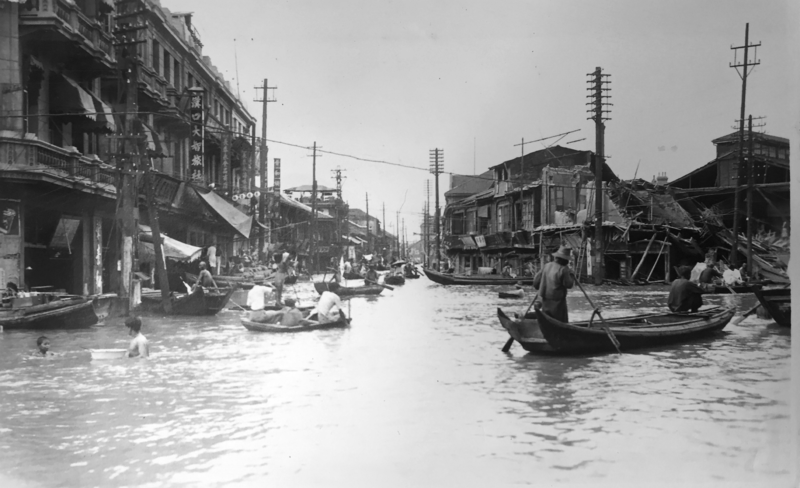 In 1931, China experienced arguably the most lethal flood in history. Rivers throughout the country rose onto their plains, inundating an area the size of England and half of Scotland combined. Around a tenth of the Chinese population was affected; over two million people died, either by drowning or by the subsequent famine and epidemics. While the scale of this disaster was exceptional, devastating floods and droughts had become increasingly common in China since the nineteenth century. Political instability, economic turmoil and incessant warfare had left the population vulnerable to environmental hazards. In most cases, rural communities bore the brunt of these disasters, but the 1931 flood was so extensive that cities also suffered. Nowhere was more profoundly affected than Wuhan, a bustling metropolis in the middle Yangzi region. Recently, while researching my book on the history of the flood, I found a short book of photographs taken in Wuhan during the disaster, published by the local Zenith Studios. The names of the photographers have long since been forgotten, but their pictures offer a fascinating insight into how a historic population coped with a deluge that inundated their homes for a number of months. The problems began in the spring as river water began pouring into the streets and mingled with effluent disgorged from overflowing sewers. Soon the whole city was permeated by a horrific stench, which only grew worse under the heat of the sun. 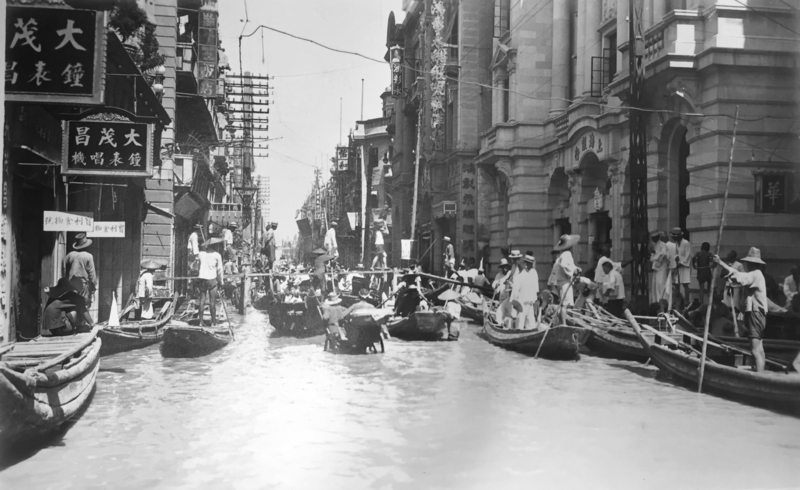 Rickshaw pullers and other menial workers had to wade through filthy water to earn a living, while customers perched precariously on the awnings. This was one of many inequalities to define experiences of the disaster. As the floodwater crept higher, the streets were transformed into canals. Enterprising sampan owners – who ordinarily scraped a living by ferrying cargo around the harbours – began renting out their boats as water taxis. Those who could not afford the grossly inflated fares took to the water in a bizarre flotilla of improvised vessels: rafts made from doors, inflated goatskins and wooden bathtubs. Some people even emptied out coffins and used them as canoes. In late July, the dykes that encircled Wuhan collapsed. The water that had been held back now cascaded into the city at terrifying speed. Flood waves scoured whole neighbourhoods from the landscape. Thousands of people living in houses constructed from timber and earth drowned or were buried alive. Those who survived salvaged what they could – a little food, religious artefacts, anything buoyant – and began their search for refuge. As the value of dry space increased, hoteliers tripled their rates, packing rooms well beyond capacity. But buildings that were already compromised by water could not cope with this additional weight, and when one hotel collapsed in August, dozens of people sheltering inside were killed. Amid the destruction and chaos, people sought to preserve a sense of normality. Workers in the United States consulate continued to hoist their national flag every morning in accordance with regulations, even though they had to row out to their flagpole. The local traffic police struggled to maintain order in streets overrun by sampans. At first they stood on boxes and tried to keep boats in lanes, but as the floodwater grew deeper they were forced to climb into the branches of trees. And when the water reached a depth of two metres, they could do little but sit back and watch as large cargo junks sailed into the city centre, careering into banks and godowns (warehouses). One particularly careless junkman sailed his vessel into the Texaco oil depository, causing a huge fire that was too hot for the fire brigade to approach. 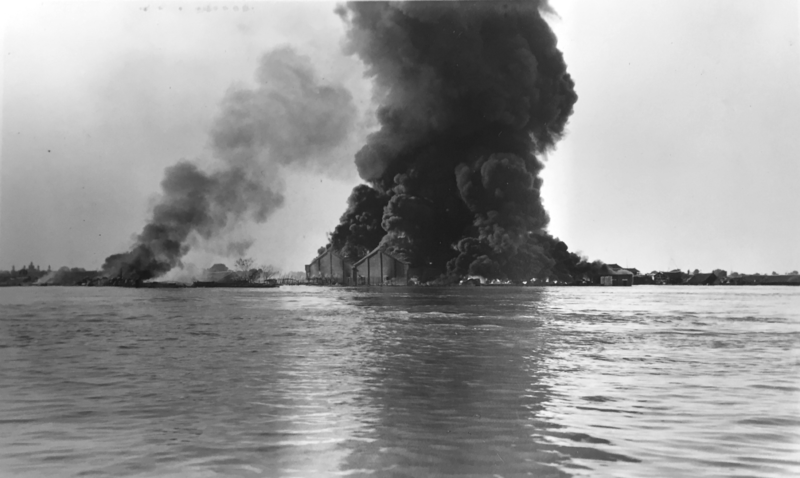 The fire burned for three days, spewing flaming oil onto the surface of the water, and noxious smoke into the atmosphere. As the city’s electrical system had long since failed, the Texaco fire offered a rare source of illumination, casting its flickering light over apocalyptic scenes: crumbling buildings, howling dogs stranded on rooftops, and thousands of floating corpses. Electricity was not the only modern amenity lost to the flood. The telegraph office, telephone exchange and airport were all forced to close. And even if large stretches of the railway line had not washed away, it would have been impossible for trains to approach Wuhan as 30,000 refugees were now living on the embankment. Though the flood seemed to have deprived Wuhan of many recent technological innovations, in many respects it was a thoroughly modern disaster. It generated risks specific to an industrial city. Loose benzene barrels bounced around the streets, kerosene fire engulfed buildings, and electric shocks killed more than 50 people. Worst of all, the sewerage system – a key emblem of hygienic modernity – emptied the bowels of the city into the streets. Soon residents were in the grip of an unprecedented health crisis. Thousands of people would succumb to dysentery, cholera and other waterborne diseases. But residents of Wuhan were not passive in the face of the disaster. China boasted a proud tradition of charitable activity, with philanthropists often funding services that were vital to the survival of disaster-stricken communities. 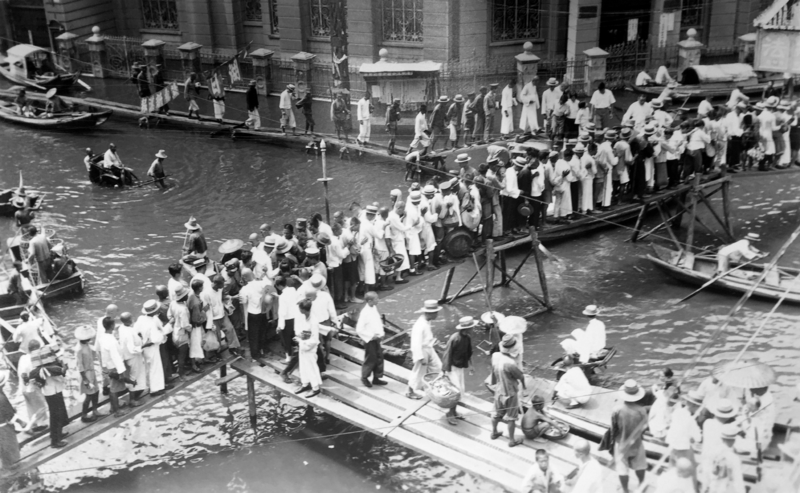 In 1931, the business community in Wuhan raised a substantial fund for flood relief. 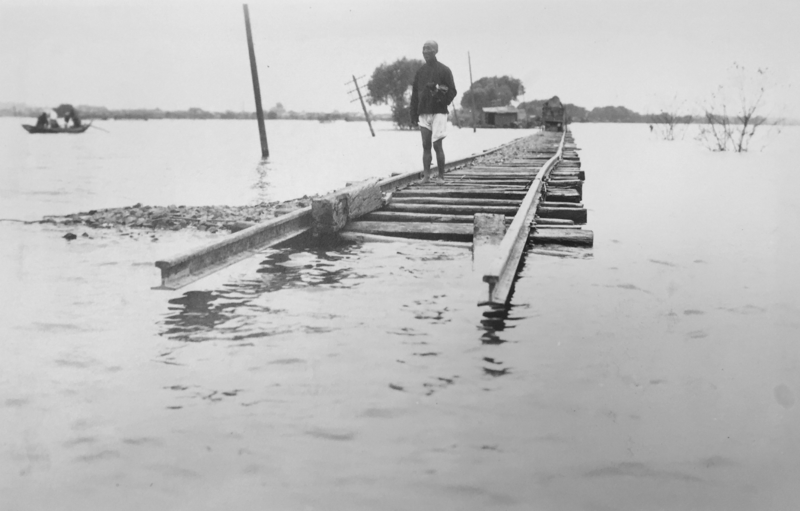 Some of this money was used to construct a wooden walkway, allowing pedestrians to wobble over the flooded streets. 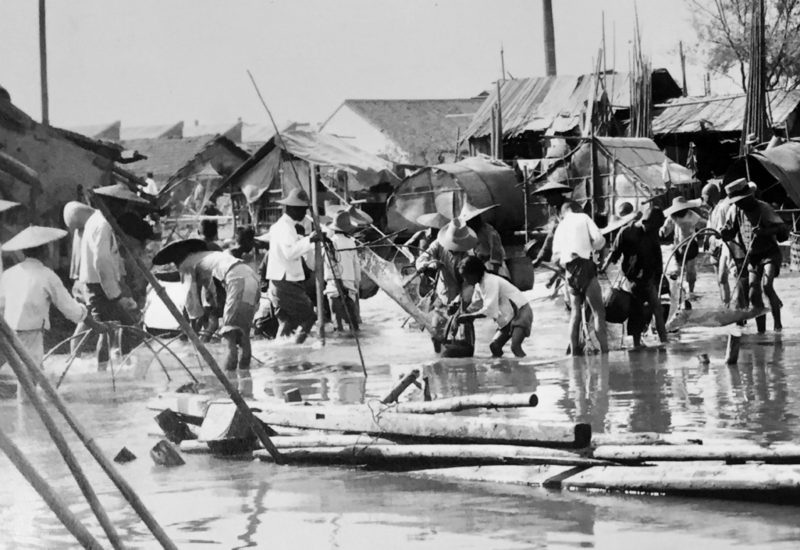 Funds were also used to sponsor rice porridge kitchens, boats to distribute boiled water, and crews to dispose of corpses. Benevolent Halls played an active role in the relief effort, as did Buddhist monks who turned their temples into refugee camps. Traditional medical practitioners massaged the stomachs of starving people and distributed herbal tinctures to prevent exposure. Later, when the official history of the flood came to be written, the government in Nanjing would depict itself as the heroic saviour of Wuhan, using modern governance to tackle a crisis. But it was traditional institutions that fed and cared for more than half a million people months before shipments of wheat and vaccines arrived in the city. This is not to suggest that refugees relied solely upon the assistance of benevolent elites. Like most people affected by disasters, they took responsibility for their own survival. In rural areas, those who had lost their farms foraged for aquatic plants such as lotus, water chestnuts, and wild rice. In Wuhan, people survived by catching fish swimming through the city streets. The flood may have been a disaster for humans, but it created excellent ecological conditions for other species. Frogs and turtles swam into inundated homes, while one cinema became home to a whole flock of ducks. Some of these species were harmful to humans. The mosquitoes and water snails that thrived in vastly expanded territories caused epidemics of malaria and schistosomiasis. Yet some of the aquatic species that flourished as a result of the flood offered a nutritional windfall for refugees, allowing them to supplement their dwindling diets. Reeds were another flood-resistant species that proved invaluable for refugees. Growing in large stands throughout this wetland region, reeds were a vital architectural material for the poor; they could be knitted together and stretched over bamboo frames to form instant shelters. Though hardly luxurious, these reed huts were both cheap and portable, allowing refugees to escape quickly when water levels rose – or when local communities proved unwelcoming. Refugees experienced both of these problems in 1931. While some citizens of Wuhan treated displaced people with great generosity, others saw them as a threat to political and economic stability. The local military were convinced that communists were using the refugee crisis as a pretext to infiltrate Wuhan. They declared martial law and began patrolling the streets in sampans with mounted machine guns. Anyone suspected of looting or other subversive activities was executed on the spot. But even such draconian treatment could not quell the paranoia, and eventually soldiers expelled refugees from the city centre at gunpoint, relocating them to ill-prepared camps on the outskirts of Wuhan where thousands would die from disease. Conditions could hardly have been more different for the relatively wealthy foreign population of Wuhan. Their exclusive concessions, located in one of the best-protected areas of the city, were among the last areas to be inundated by the flood. When the waters finally did arrive, foreign residents amused themselves by riding horses through the water or playing tennis on roofs. But before long the novelty wore off. The flood stank, there was no electricity for lights and fans, and the price of vegetables and meat had become extortionate. 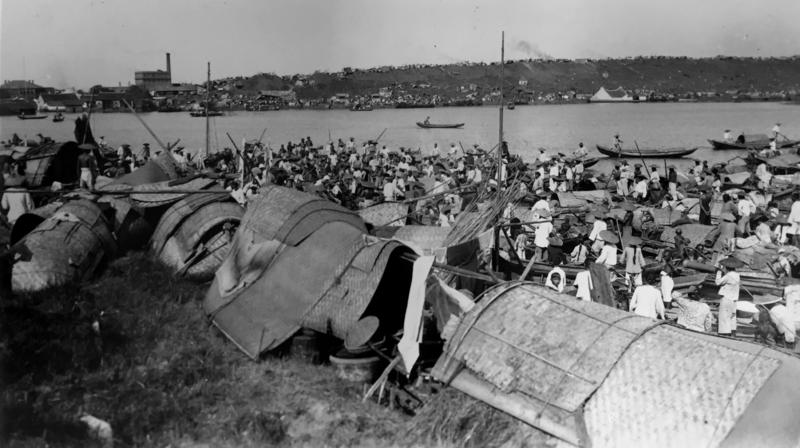 The solution was to take a ferry to the foreign clubs in the northern part of the city. 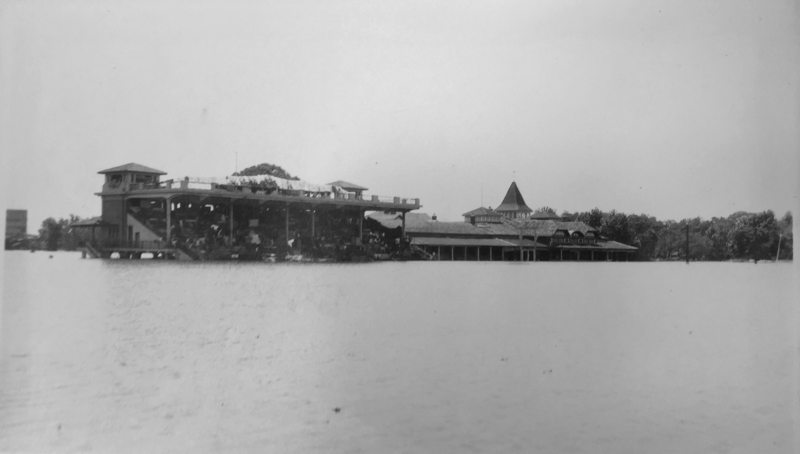 Unable to indulge in customary amusements – such as horse racing, polo and golf – club patrons stared out onto the flooded grounds, making idle chitchat and drinking. As the city’s ice factory had ceased working, they took their drinks neat while a large number of refugees congregated on the grandstand next to the stables a short distance away. Concerned club owners hired boats to transport their horses to Shanghai, and then petitioned the city authorities to have the refugees removed to preserve the hygienic wellbeing of club members. Those who whiled away their hours in the clubhouse were separated by little physical distance from those who sheltered in the grandstand, yet the experiences of these two parts of Wuhan’s population could hardly have been more different. It was as if they were living through two separate floods; one that caused mild inconvenience and boredom, and another that destroyed lives. On some occasions, disasters can bring communities together, creating what the historian Greg Bankoff has described as “crisis solidarity”. Yet disasters are equally capable of amplifying societal divisions, laying bare the tensions that lie beneath the surface in normal times. Both of these processes were at work in Wuhan in 1931. While the community was unified by charity and mutual aid, it was also divided by economic calculations and political violence. For refugees, these tensions were just as dangerous as the incessant rainfall and raging rivers. They established the social conditions that helped to translate a natural hazard into a humanitarian disaster. The photographs in this article were originally published in 漢口水災攝影 Hankow Flood Pictures, 真光照相館 Zenith Studios, Wuhan, 1931. Despite considerable effort, regrettably it has not been possible to locate the copyright holder for this collection. Chris Courtney is the author of The Nature of Disaster in China: The 1931 Yangzi River Flood, Cambridge University Press, 2018. This article was first published on chinadialogue.net.